Introducing JuiceBox user John Higham from California. John is an aerospace engineer and early adopter who’s been driving electric cars since 2012. 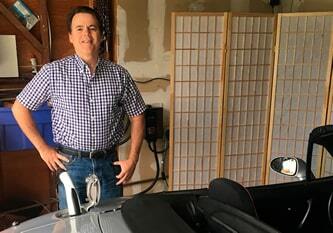 John has used charging stations from a number of different manufacturers, but when it comes to his garage, it’s a JuiceBox Pro 40 that charges his EVs. Below is John’s story, and why he loves his JuiceBox. In 1972, when in the 6th grade, I built a small see-thru rotary engine for a science fair. This was accompanied by a presentation about the environmental benefits of fuel economy. I don’t think anyone in rural Utah where I grew up saw that coming. By the time I was in college I was convinced that the electrification of personal transportation was inevitable; what I didn’t know then is that it was still going to take four or even five more decades. Today I am even more firmly convinced the electrification of personal transportation is inevitable. My first EV was a Miata conversion that was built in my garage as a father-son project. The Miata has been on the road for about five years now and it commands the cherished spot in the garage, even while much newer cars are relegated to the driveway. I also have a leased BMW i3 that will be returned later this summer. Other EVs I have owned include a BMW ActiveE and (yet another) BMW i3. After our current BMW i3 lease is returned we will be adding another EV to our driveway this year; which one we add depends on my mood when you ask. "Today I am even more firmly convinced the electrification of personal transportation is inevitable." I’ve owned several different EVSEs over the years including a ChargePoint CT-500, the ChargePoint Home, the original JuiceBox (kit version, of course!) but by far my favorite has been the JuiceBox Pro 40. There are other well-made EVSEs that cost less than the JuiceBox Pro but in my view, the JB Pro is the best value on the market today. Here’s what I look for in an EVSE. First is that it is portable. To me this means more than it is plugged into a NEMA 14-50 socket (as opposed to being hard-wired); it also means it is compact and light enough that I can put it into a small duffle bag and take with me on road trips. I confess that as newer EVs with DCFC proliferate, this feature may not be as important as it once was. But the EV pioneer spirit in me says it is best to be prepared. Secondly, and this is related to the above-mentioned portability, is the ability to limit the output power on demand. If I drive to my mom’s house and plug into her dryer outlet, I need to be able to reduce the power output to not overwhelm the wiring in her garage. The JuiceBox Pro app lets you do this. This ability also allows two JuiceBox Pros share a 50-amp circuit without overloading it. The best and most important feature is the data. Even if you don’t think you care about data you’ll be glad you have it. I have had charging irregularities on my i3 that would have been impossible to troubleshoot at home without data. I have also seen plenty of occasions in online forums where having data from a charging session meant being able to demonstrate to a dealer that yes, the car does need servicing under warranty. Other EVSEs have data, but the JuiceBox just does it better. First, the data is persistent. 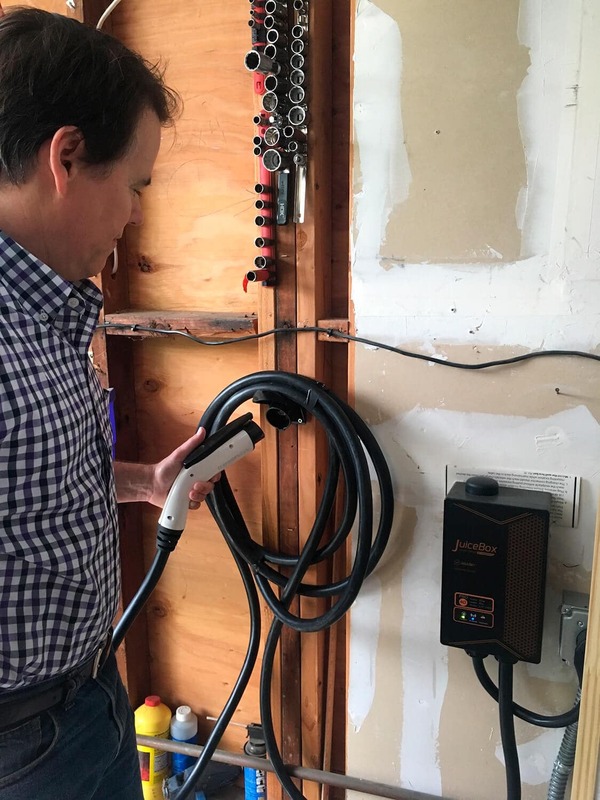 As an example, with the ChargePoint Home as soon as you unplug the car the details of the charging session disappear – only a charge summary remains. The JuiceBox stores data at more frequent intervals but also saves the data from the entire session. Last, but not least, depending on where you live and which local utility you use, the JuiceBox Pro can also manage your charging session depending on the state of the grid. The JuiceBox servers are working in the background and monitoring the energy sources on the grid at any given moment. If you opt into this service, called JuiceNet Green, then the JuiceBox will start your charge session only when the cleanest power plants are producing in your area. Alternatively, they can inhibit your charge session if the grid is stressed and near peak capability; this can earn you cash rewards as compensation for delaying your charging session. As you can see, I’m very happy with my decision to use a JuiceBox to charge my electric cars. The high power, portability and most importantly the smart charging features really set it apart from the competition.